"De la Madrid Finallly Confirms: "Salinas Stole the 1988 Election!" US Media: "How Did We Miss This STORY?" WSJ: "NAFTA! - Another Triumph for Electronic Voting!"" Al Gore Comments:"Not Another Stolen Election!"" The following story is not one that leading US investigative media like The New York Times and The Wall Street Journal should be proud of, because for reasons that are unclear, they basically dropped the ball on covering it back in the 1980s. But it certainly still deserves their attention now. 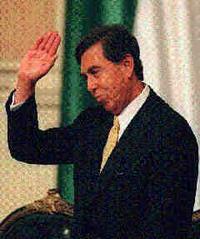 As former Mexican President Miguel de la Madrid has now confirmed in his autobiography, published this week in Mexico City, former Michoacán State Governor and Mexico City Mayor Cuauhtemoc Cardenas would have won Mexico's 1988 Presidential election, if not for the systematic fraud committed by the PRI, de la Madrid's party. The following article examines this 1988 Mexican electoral fraud, one of the first "computer-assisted" electoral frauds that we know of, in detail. It considers how the fraud was perpetrated, the interests that it served, the corporate and government collaborators who knew about it at the time but kept still, and its far-reaching consequences for Mexico and the rest of Latin America. Of course Mexico's electoral rigging was not unique. While this case had unusually far-reaching results, similar frauds have occurred in many other developing countries, as well as some "developed" ones. As the technology for organizing and conducting elections becomes more and more digital, some have hoped that we'd able to build in automatic checks and balances that would make traditional "paper ballot-stuffing" more difficult, if not impossible. As we've recently seen in the initial US experiments with electronic voting, however, and as this Mexican case also demonstrates, even sophisticated computer technology is not sufficient to avoid determined fraudsters -- especially high-level ones -- when the stakes are this high. From the standpoint of First World foreign policy, this is yet another example of the fundamental ambivalence that First World powers like the US, France, and the UK continue to display toward popular movements and democratic choice in developing countries. Where popular choice favors policies and interests that the First World supports -- as in Iran, Syria, Belarus, North Korea, and perhaps Iraq today -- the First World is all in favor of "democracy." Where popular choice favors policies and interests that it opposes, however -- as in this 1988 Mexican case, Chile in 1973, Venezuela in 2002, South Africa until the fall of apartheid, Nicaragua in 1984, China in 1989 and since, Indonesia until the fall of Suharto, the Philippines under Ferdinand Marcos, Mobutu's Congo, the West Bank/Gaza, Morocco, Haiti in 1991 and perhaps today, and Pakistan -- the First World has little compunction about supporting authoritarian regimes. We might have hoped that this schizophrenia about authoritarianism was just a Cold War relic, which would have faded along with it. But it continues to this day, and seems to express a much more fundamental, unresolved tension between the First World's desire for "stable conditions and free markets" in these countries, and its desire to see them develop representative political systems. 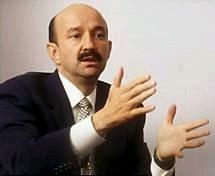 President Miguel De la Madrid’s anointed successor in 1988 was Carlos Salinas de Gortari, a fortyish Harvard technocrat. Like his mentor, Salinas was a member of the PRI’s quasi-hereditary revolutionary family. His grandfather was a prominent Monterrey businessman, and his father, Raul Salinas Lozano, also a Harvard graduate, had been a minister of commerce in the l960s. Salinas was not only wellborn, but also precocious: At age four, he had picked up a pistol and shot his maid dead. He finished his Harvard Ph.D. in political science in l978 (his dissertation was on the “impact of government spending on elections”), and by l982, he was already minister of planning—the youngest Cabinet member ever at thirty-five. Like de la Madrid and many other U.S.-educated elite/technocrats in the PRI’s “reform” wing, Salinas believed that Mexico’s main problem was its own bloated government. He favored downsizing the state, deregulating the economy, and actually increasing the role of foreign banks and investors. Despite a complete dearth of new loans, he and de la Madrid continued to pay all of Mexico’s foreign interest bills on time, repeatedly restructured the debt, and experimented with almost every idea on the bankers’ wish list, including debt swaps, securitization, debt conversions, and privatization. Mexico’s debt emissaries spent a fortune on innumerable junkets to Paris, London, Washington, D.C., and New York. Meanwhile, the country staunchly refused to be drawn into a debtors’ coalition with Brazil, Argentina, and Peru. Given the banks’ unwillingness to provide Mexico’s government with any more loans, the skepticism that foreign investors had toward the country, and the government’s reluctance to get tougher with foreign banks and its own domestic elites, Mexico had little choice but to rely on its own resources to finance investment. Since Salinas and de la Madrid wanted to shrink public spending and budget deficits and were unwilling to tax the elite, they raised interest rates to stimulate private savings. That reduced growth and unemployment, which was anathema to workers, campesinos, and “protected” business sectors. But the de la Madrid-Salinas program was supported enthusiastically by Mexico’s top families, bankers, the bureaucratic elite, union bosses, oil workers, police chiefs, and Army officers. Given the one-party system, these were the only constituencies that really counted. The economic program turned out to be very unpopular, and Salinas’s detractors in the PRI worried that it might be a mistake to bet on an uncharismatic technocrat in a period of rising political ferment. But this argument carried little weight with de la Madrid, who’d once been an uncharismatic planning minister himself. So in September 1987, Salinas was nominated the PRI’s candidate for president. Almost immediately, the regime’s policies began to misfire. The global stock crash that took place in October 1987 actually started in Mexico City when the Central Bank suddenly lifted restrictions on investments in debt instruments, causing the Mexican stock market to lose three-fourths of its value in one week. Capital flight resumed, the government missed its budget targets, the peso sank like a stone, and by year’s end, inflation was at fifteen percent a month and rising. De la Madrid was forced to implement yet another round of “belt tightening,” squeezing credit and freezing wages and prices. Since 1981, Mexico had experienced seven years of negative growth. Real incomes for everyone but the elite had fallen by a quarter, and there were incipient signs of social unrest all over the country.The country stagnated under the weight of its foreign debt, which totaled $101 billion by l988. The July l988 presidential elections were the greatest challenge to the PRI’s hegemony in its history—at least until Vicente Fox won in 2000. In the party’s first deep split since 1929, Cuauhtemoc Cardenas, the PRI’s governor of Michoacan State and the son of President Lazaro Cardenas, who nationalized the oil industry in the l930s, joined forces with disenchanted leftists and nationalists to form the “National Democratic Front.” The Front’s radical rhetoric gave voice to widespread discontent. It also claimed to support democracy, but had a few strange bedfellows of its own, including Luis Echeverria Alvarez—Mexico’s president in the 1970s and one of Mexico’s wealth- iest men—and Hernandez Galicia, head of the powerful PEMEX oil workers' union. But at least it supported a popular job creation program, which it intended to pay for with a repudiation, or radical restructuring, of Mexico’s foreign debt. Just a few weeks before the 1988 election, Cuauhtemoc Cardenas had been doing very well in the polls. Salinas, on the other hand, would have nothing to do with such irresponsible policies. 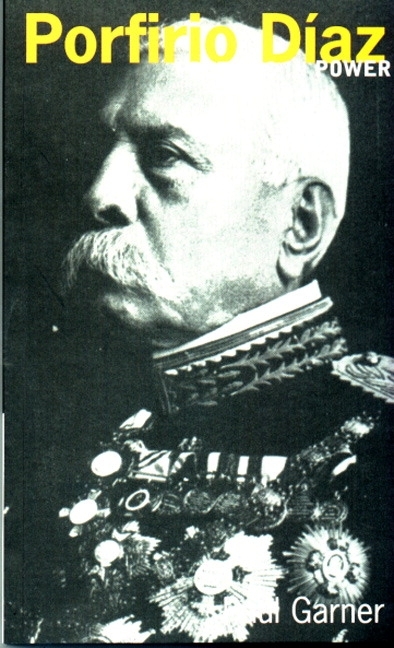 The consummate planning bureaucrat-turned-free marketeer, he saw himself as continuing the tradition of authoritarian top-down reforms begun by Porfirio Diaz—the tough nineteenth- century dictator who ruled Mexico for thirty-five years with the support of the landowning elite—foreign bankers and investors, and his own well-heeled entourage. Evidently, many Mexicans did not share Salinas’s enthusiasm for Porfirio Diaz or for the neoliberal agenda.To them, he was still just another in a long series of little-known, remote members of the Priista (pertaining to the PRI party), priestlike technocracy who came down from the temple every six years and went through the motions of seeking their mandate. Despite massive advertising on his behalf by the PRI’s machine (with help from Hill and Knowlton, the renowned PR firm whose clients had also included Duvalier and BCCI), as of election eve, non-government polls found that he and Cardenas were still running neck and neck. Of course many voters viewed all Mexican elections with skepticism, because of the PRI’s long history of election fraud. 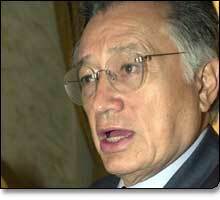 But Salinas and his predecessor, Miguel de la Madrid, had sworn this time it would be different. On July 6, 1988, when the polls closed and the government started tallying the count at its central computing office in Mexico City, the country eagerly awaited the results. There was much disappointment when Manual Bartlett, the PRI’s interior minister in charge of administering the vote, announced the next morning that the Federal Election Commission’s computer system, supplied by UNISYS, had crashed and that the results would be delayed. When they finally emerged a week later, Salinas was declared the victor by a wide margin. Officially, the PRI received fifty-two percent of the vote, compared with the PRD’s thirty-one percent, and the business party PAN’s seventeen percent. Opposition leaders have claimed that the computer crash was contrived to buy time for rigging the vote once it became clear that Cardenas was winning. Despite widespread rumors, these claims were not easily confirmed. Many of those on the inside were too scared to talk, and, as noted above, Salinas’s foreign supporters, including leading newspapers like The Wall Street Journal (whose parent company, Dow Jones, added Salinas to its corporate board, and The New York Times did not investigate too deeply. Evidently a compliant, Harvard-educated, technically-competent neoliberal was expected to serve the mutual interests of Mexico and its trading partners better than Cardenas. We arrived at work on the morning of July 6, election day, at the central computer and statistic official.When we got there we discovered that the rooms were empty and our computers weren’t there. We were ordered into a minibus and taken to the Government House (in Mexico City), to a room with blacked-out windows. Our computers had been set up there, complete with the voter database.We started to enter the data. As the supervisors saw that Salinas was losing, they ordered us to leave aside votes for the PRI and only enter opposition votes. Then, at about 3 A.M. on July 7, the supervisor called a halt, and with tears in his eyes, he told us: ”If you care for your families, your jobs, and your lives, enter all votes from now on in favor of the PRI. I went back to work and did as I was told. I wanted to cry, but I had to do it. They kept us there until five or six in the evening the following day. When I’d finished my work, I called up the voting record for my uncle, and to my astonishment the computer record showed that he, an opposition supporter, had voted for Salinas.That was when I realized why we had been told only to enter opposition votes in the beginning. While we were away from the computers, they had reversed all the data from the first session of data capture so all those votes showed up as Salinas votes. In December 1994, Adolfo Onofre, the courageous computer consultant who had cooperated with the investigation of the Unisys computer “failure,” was arrested and badly beaten by Mexico’s Federal Police when he returned to Mexico City from Britain, where he had sought political asylum. In the first instance, the 1988 electoral fraud made de la Madrid's successor, Carlos Salinas de Gortari, the President of Mexico, and also made him a very wealthy man. It also supplied him with many honors, including a Wall Street Journal board seat (from the early 1990s until April 1997), a near-nomination by President Bill Clinton in 1995 to head the World Trade Organization, and numerous speaking engagements at leading US universities like Stanford and Harvard, his alma mater. More important, as discussed in more detail in our new book The Blood Bankers, it also cleared the way for Mexico's neoliberal "reforms" of the early 1990s, which set the pace for the entire rest of Latin America. These measures included the North American Free Trade Agreement (NAFTA); the privatization of Telmex, Mexico's state-owned telephone monopoly, Mexico's entire banking sector, and many other state-owned companies; and the rapid opening and deregulation of Mexico's capital markets that ultimately led to the catastrophic 1995 "Tequila" debt crisis. At the time, these measures delighted Mexico's elite, foreign banks, and leading multinationals, as well as multilateral financial institutions. Even before his “election,” Salinas was already the favorite son not only of Mexico’s oligarchs and party bosses, but also of leading multinational investors like GE, Allied Signal, Alcoa, and GM, commercial banks like Citibank and JP Morgan, investment banks like Goldman Sachs and Morgan Stanley, and, unofficially, the US Government and its financial acolytes, the IMF and the World Bank. In two years before the l988 elections, these two government institutions alone provided Mexico with $4 billion of new credits, while private banks had helped out by by rescheduling $43 billion of Mexico’s outstanding debt -- huge amounts at the time. Before and after the election, a parade of First World leaders, including George H.W. Bush (who was good friends with Salinas’ father, Raul Sr.), Paul Volcker, Citibank Chairman John Reed, newly-elected World Bank President Lewis B. Preston (formerly of JP Morgan), IMF Director Michel Camdessus, and many lesser officials and bankers descended on Mexico to encourage its new-found passion for free markets. They praised the quality of the PRI’s Ivy-League-trained economists and touted Mexico as a model of stability and growth -- much as they had done with Ferdinand Marcos in the Philippines two decades earlier. your jobs, and your lives, enter all votes from now on in favor of the PRI. I went back to work and did as I was told. I wanted to cry, but I had to do it. After the 1988 election, foreign investors also stepped forward to ratify Salinas’ agenda. From 1988 to l994, Mexico became the darling of the international investment community, attracting more foreign investment than any other developing country except China. It accounted for nearly half of the $175 billion of new foreign direct and portfolio investment that poured into Latin America in this period. In the wake of the debt crisis, “foreign” investors -- including members of the domestic elite who secretly repatriated flight capital to avoid taxes and conceal their investments -- replaced foreign bankers as the leading suppliers of finance to Mexico and other “emerging markets, ” providing more than three-fourths of Mexico’s entire capital budget. Much of this capital was attracted by Salinas’ privatization program, one of the most aggressive in Latin America. This involved selling off public assets in key sectors like telecommunications, steel, airlines, and banking, including the re-privatization of all the banks that President Lopez Portillo had nationalized in the early 1980s, and using the proceeds to finance the budget. By l994 this firesale had raised $24 billion, more revenue than in any other Latin American country. As discussed in our book, in late 1994-95, this balloon was punctured -- Mexico experienced a sharp currency devaluation and a foreign debt crisis, with rising unemployment, declining real wages, and growing inequality. By the year 2000, relative to US per capita income levels, Mexico had fallen below where it stood when Salinas took power in 1988. (World Bank data - 2004). Neoliberal economists have tended to compartmentalize the analysis of these "reforms," and also consider them apart from their political and social effects, including increased corruption and greater regional tensions within Mexico. Even the World Bank now concedes that NAFTA was "not a substitute for a development strategy," that real wages declined, overall unemployment rose, and poverty and inequality remained huge during the 1990s, and that NAFTA's maximum benefit to Mexico was "a rather small one" of +4-5% of GDP over 10 years -- a rounding error, compared with the -6% impact of the Tequila Crisis in 1995-96 alone. Other analysts, such as Carnegie, are even less enthusiastic. I, and all of you, have earned so much money over the past six years that I think we have a big debt of gratitude to this government. I'm ready to more than double what has been pledged so far, and I hope that most in this room will join me. We owe it to the president, and to the country. The Mexican magnates responded to this challenge -- that night the PRI reportedly collected $25 million from each of them for a grand total of $750 million. That established a world record for a single evening’s fund-raising. (President Bush, restrain your envy!) 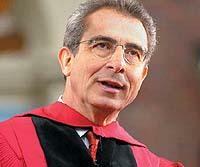 Zedillo, a Ph.D. economist who has subsequently returned to Yale as a professor of international economics and Director of the new “Yale Center for the Study of Globalization,” must have been grateful for this incredible act of selfless generosity. In 1988, with the complicity of powerful interests at home and abroad, as well as many cheerleaders for the neoliberal orthodoxy in the US Government, multilateral financial institutions, and the Establishment Press alike, the Mexican people simply got robbed. As we approach the US' own 2004 Presidential elections, with all the debate about "electronic voting," it is also interesting to note that computer fraud played a central role in Mexico's 1988 rigged election. UNISYS, the leading US company that supervised that election, has long refused to comment on what happened. But as we'll see below, its Mexico City employees apparently knew all about what was going on. All told, the consequences of Mexico's 1988 stolen election have been very far-reaching indeed. Some will argue that the gains may have been "worth it" -- that, like Russia's neoliberal reforms in the 1990s, Mexico's ultimately left the country better off, even though they were very imperfect; furthermore, that Cardenas proved to be a disappointment in Mexico City, and if Salinas is to be believed, perhaps even a bit fallible himself. But all this is really beside the basic point -- ordinary Mexicans were supposed to be allowed to make such judgments for themselves. In 1988, with the complicity of powerful interests at home and abroad, as well as many cheerleaders for the neoliberal orthodoxy in the US Government, multilateral financial institutions, and the Establishment Press alike, the Mexican people simply got robbed again. But perhaps that was such an old story that the US media did not consider it newsworthy. (c) James S. Henry, Submerging Markets, 2004. All rights reserved. Not for quotation or other use without express consent. This is an outstanding summary of those until now little-publicized events during Mexico's 1988 election. Those that are recent newcomers to following Mexican politics may find difficult to appreciate just how tightly the information was controlled in Mexico prior to 1994 and how ground breaking is that the information is finally coming to light.